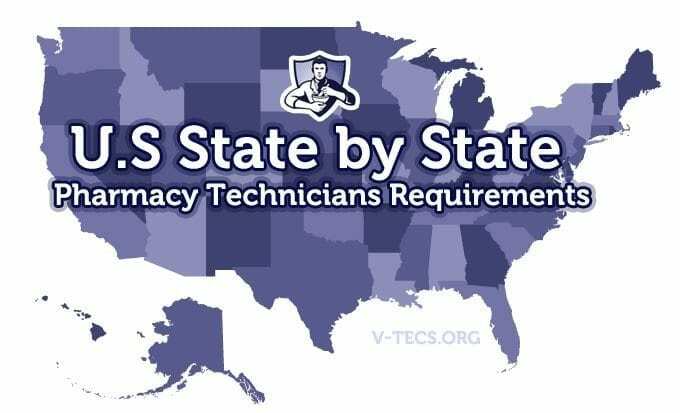 We have put together a list of the requirements for each state to become a pharmacy technician. They are in alphabetical order for your convenience. Please keep in mind that although we try to keep this list updated, you should always double check your state’s health reference website before committing to a plan of action. Alabama – Have a job within a pharmacy and then you have to register with the state board. Alaska Gain employment as a pharmacy technician in a training capacity under the guidance of a licensed pharmacist, and then register with the state board. Arizona Gain the PTCB (Pharmacy Technician Certification Board) certification. Arkansas Have a job within a pharmacy and pass the test provided by the state through your employer, or you can take the preferred route of obtaining certification from the PTCB. Also see Pharmacy Technician Schools in California. Colorado There are no particular license regulations for pharmacy technicians. Those with certifications and additional education will have preference at the entry level. Connecticut Be trained by a pharmacy manager and have it documented, and then applying for state certification. You can also obtain the PTCB certification or obtain another certification that is approved by Connecticut’s Department of Certification of Pharmacy. Delaware No regulations for licensure. Florida Finish a training program that is approved by the board. Also see Pharmacy Technician Schools in Florida. Georgia You need to register with the state board. Hawaii There are no regulations for licensure. Idaho Have to earn either the ICPT or the PTCB certification. Illinois You can have an on the job training program and complete the PTCB certification or you can finish a pharmacy technician training program. Indiana The completion of a board approved training program or obtaining the PTCB certification is required. Iowa First, you have to get registered with the state board, and then you have to complete either the ICPT or the PTCB within a year. Kansas Have a job in a pharmacy and then complete a test provided by the state through your employer. They can train you or you can do the training on your own. Kentucky Have a job in any pharmacy and get registered with the state board. Louisiana There are quite a few things you have to do. 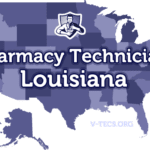 First you have to have a job in a pharmacy, then you have to apply for the Pharmacy Technician Candidate certificate from the state board. After obtaining that certificate you have to complete a training program that is approved by the state withing a year and a half of gaining that certificate. Six hundred hours of practical experience with two hundred of that being through a training program is needed. Lastly, you have to pass a certification exam that is board approved. Maine Go through on the job training and then register with the state board. Advancement opportunities really only come to those that are certified by the PTCB though. Maryland Gain a certification that is board approved like the PTCB, or you can complete a training program that is board approved and has at least 160 hours of experience working and doesn’t last long than half a year. Massachusetts You can complete an ASHP accredited program, or a program that is offered by the federal armed services, or one that is approved by the state board. If you don’t want to go that route, you can get 500 hours of work experience documented by your employer and then take a state approved exam or the PTCB. Michigan There are no regulations for licensure. Minnesota Gain employment in a pharmacy and then register with the state board. Mississippi Go to the state board and apply for certification and then take either the ICPT or PTCB exams. Missouri Get a job in a pharmacy and then register with the state board. Montana First, register with the state board, and then you have a year and a half to obtain the ICPT or PTCB certification. Nebraska All you have to do is get registered with the state board. Nevada Finish a training program that is ASHP accredited. You can also go the route of gaining 1,500 hours of experience and training that is documented by your employer. You can also go through a training program that is offered by the federal armed services, or you can skip any of these options if you already have the PTCB certification from another state. You can also transfer your registration from another state as well. New Hampshire Get a job in a pharmacy, then go through some on the job training, and finally get registered with the state board before thirty days of being employed. New Jersey Get registered with the state board. New Mexico First you have to get registered with the state board as non-certified, then you have to get on the job training from a pharmacist that is documented. Then you have to apply for certification, and finally pass the ICPT or PTCB certification. New York There are no regulations for licensure. North Carolina There are three different choices you have in NC. You can go through on the job training, which has to be completed within the first 6 months or being employed and then you can register with the state board. You can also complete a training program for pharmacy technicians that is offered by a community college. Lastly, you can get your PTCB certification and get registered with the board. North Dakota Finish a program that is accredited by the ASHP. You can also go through your training on the job under the tutelage of a pharmacist that is licensed. Ohio First you have to get registered with the state board, then you have to obtain your ICPT or PTCB certification within the first 210 days of employment at a pharmacy. Lastly, you can go through on the job training and then pass a test given by the employer. Oklahoma Obtain a job in a pharmacy and then go through training that is provided on the job by the pharmacist in charge or a staff pharmacist. Oregon Have a job in a pharmacy, get registered with the state board, and then pass a national certification exam before a year has passed from the time of registration. You can also obtain your ICPT or PTCB certification and then do on the job training which would be documented by your pharmacist doing the training. Pennsylvania There are no regulations for licensure. Rhode Island Go through a training program that as accredited by the AHSP. You can also finish a training program that is given by the federal armed services. Lastly, you can finish a program offered at a community college or earn your ICPT or PTCB certification. South Carolina Get registered with the state board. South Dakota Have a job in a pharmacy and then get registered with the state board, or you can be in a training program and then register with the state board right before the on-site work is started. Tennessee Get a job in a pharmacy and then register with the state board. Texas First, get registered as a technician that is still in training. Then you have to obtain your PTCB certification and go through on the job training. Utah Gain your ICPT or PTCB certification, and then complete a training program that is board approved that has 180 hours of training in the practical sense. Vermont Get registered with the state board. Virginia You can go through a training program that is board approved, or you can get your PTCB certification and then get registered with the board. Also see Pharmacy Tech Schools in Virginia. Washington Complete a national certification exam, and then go through a board approved program for training. West Virginia You can get a job in a pharmacy, then go through on the job training, and then pass a state test. You can also go the route of becoming PTCB certified and then going through 20 hours of on the job training. Wisconsin There are no regulations for licensure. Wyoming Get your PTCB certification. Washington D.C. There are no regulations for licensure, although within the next few years that may change.